The Kalamazoo Promise, an anonymous benefactor, is providing four-year-scholarships to almost all of the students who graduate from Kalamazoo Public Schools. One student from Kalamazoo Central High School, Jay Valikodath, said the Promise changed his and his classmates’ lives, because they'll be able to start their careers after college debt free. Bob Jorth, the director of the Kalamazoo Promise, says they have covered 43 state-supported community colleges and universities in Michigan. They are partnering with the Michigan Colleges Alliance, which will add 15 private colleges and universities in Michigan. The Promise will cover tuition at colleges with the same average tuition rate as the University of Michigan’s College of Literature Arts and Sciences. Anything beyond that will be covered by the institution. The promise has paid more than $54 million in tuition for 3,286 students, not including this current school year. A total of 679 of those students earned associates, bachelors, or some form of post-secondary education degree. That’s a little more than 20% of those who have received grants. Jorth added that the main goal is to get as many students as possible pursue a post-secondary education. -Bre'Anna Tinsley, Michigan Radio Newsroom. The Kalamazoo Promise is expanding to include more than a dozen private colleges in Michigan. 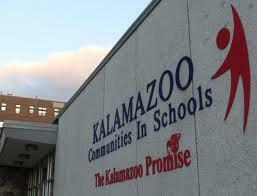 The Promise provides scholarship money for Kalamazoo public school students to attend college. Until now, the Promise has made it possible for students to afford only public colleges and universities. But today, the Promise’s Janice Brown announced 15 schools, including Detroit Mercy, Hillsdale College, Hope College and Adrian College, will start matching Promise scholarships beginning in the fall of 2015. One of the founders of the Kalamazoo Promise is stepping down after five years with the education scholarship program. Janice Brown has served as the Kalamazoo Promise’s executive director since 2008. Before that, she was the superintendent of Kalamazoo Public Schools.